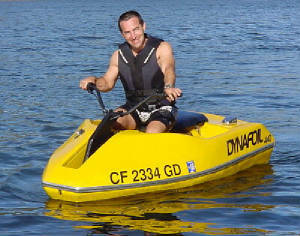 The Dynafoil Personal Watercraft Website Contact Me Page. Hi and thanks for taking a look at the web site. If you have any comments or suggestions, share my interest in Dynafoils or have Dynafoil information, please drop me a line. This website continues to grow, so check back occationally. I'm currently attempting to locate the former staff members of Dynafoil, Inc. so if you know how to get in touch with any of these people, please either let me know, or let them know that I would really enjoy hearing from them. Why do I want to talk with these people? Simple really; this is personal watercraft history, it's an important story, and who better to tell it than the people who were right there in the company inventing, designing, riding, racing, testing and building a watercraft like no other (either then or now). Dave Cline, Dynafoil Inventor and founder of Dynafoil, Inc.
Mike Reuse, Featured demonstration rider in all the brochures and flyers, and an outstanding mechanic. Jerry English, Design engineer and production manager. In October 2007 My brother Tori located Mr. English! He still has his Dynafoil and Tori has inspired him to get it running so we can all go riding. They've gotten together twice, and on the second time, Tori took him Wetbike riding. Please! Remember to put a heading in the subject line so I don't delete your email as spam!